Getting a point across using screenshots and annotations should feel like a breeze. That's why we've worked hard to build Marker.io's annotation tools editor from the ground up! 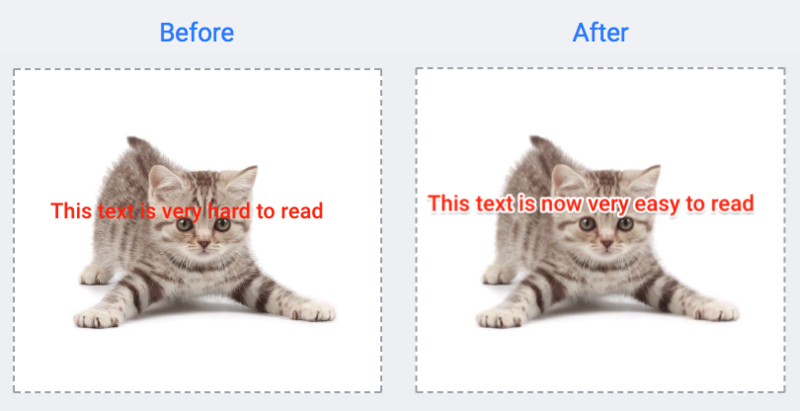 Keeping text readability when writing on top of color-rich images and elements has always been tricky. We added a white overlay and black shadow to text elements to avoid blending the text in with the screenshot. Take a look at before and after the update. This was a highly requested feature: the ability to easily add, edit and remove annotation elements directly via your keyboard. Selection of elements: Arrow (a), Text (t), Rectangle (r), Oval (o), Pen (p), Emojis (e) and Blur (b). If you don't remember a specific keystroke, hover over the element and after a couple of seconds, a tooltip will appear explaining how to select each element with your keyboard. When reporting visual feedback, you might have some confidential information that you'd rather hide. That's where our blur tool comes in. Now you can quickly draw over an area, immediately masking the confidential information and making it impossible to read.